Kevin Peacock won the Rookery Waters winter qualifier. Kevin Peacock won the Rookery Waters Saturday winter qualifier open match on the Magpie Pool. He used 6mm expander over 4mm hard pellet at six metres from peg 13 to catch carp for a total of 87lb 12oz. Ricky Ashwell caught late down the edge on maggot for second place with 85lb 10oz and Tony McGregor was third on 55lb 4oz. Webb’s AC were on the Magpie Pool at Rookery Waters on Sunday but unfortunately it was something of a struggle after an overnight frost. Matchwinner Mick Linnell was one of those finding it tough going in the first half of the day, but a switch to a waggler and red maggot approach saw him romp home with 45lb 7oz. Ken Allum was second on 31lb 10oz and Andy Perry third on 18lb 4oz. Lucio Melillo Junior topped a small field with a modest 13lb 8oz. 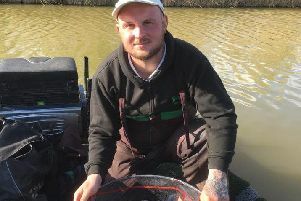 Then it was Martin Harwood on 12lb 3oz followed by Lucio Melillo Senior on 7lb 3oz.